Please download the full report here. Also available in Spanish here. Defend Job Philippines is an active member organization of ESCR-Net since 2014. It was established on July 19, 2009 as a wide network to defend jobs initiated by women workers of Triumph International who fought against illegal and unjust lay-off and closure. Currently, Defend Job has wide network of displaced workers, unions, women and informal sectors united for better working and living condition. In January 2015, the CAWG facilitated a SCS meeting in Mexico between Defend Job and other member organizations to brainstorm about ways to improve the campaign. Organizations invited to participate in the SCS discussion were Proyecto PODER (regional organization based in Mexico), Otros Mundos (Chiapas, Mexico) and Comite Si a la Vida (Tolima, Colombia). 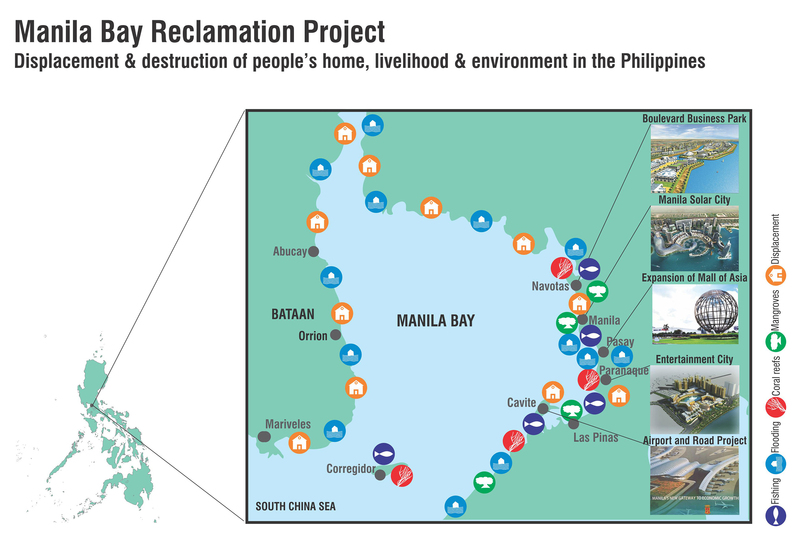 The purpose of this report is to draw attention to critical human rights issues caused by the Manila Bay Reclamation Project and identify strategic areas of support to the Defend Job’s advocacy campaign. The main goal of Defend Job’s campaign is to pressure the Philippine government to stop the development project to avoid its consequent impact on people’s human rights. Identify and analyze relationships between corporations involved in the Reclamation Project and the Pilipino government, and additionally defining the role of the state in the development project. Elaborate a human rights impact assessment. Please download the infographic here.